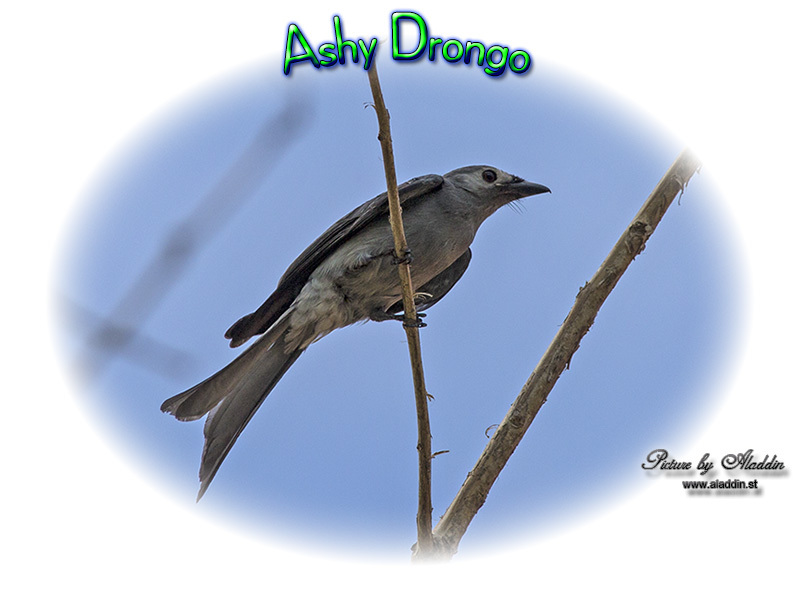 The ashy drongo (Dicrurus leucophaeus) is a species of bird in the drongo family Dicruridae. It is found widely distributed across South and Southeast Asia with several populations that vary in the shade of grey, migration patterns and in the size or presence of white patches around the eye. The ashy drongo breeds in the hills of tropical southern Asia from eastern Afghanistan east to southern China and Indonesia. Many populations in the northern part of its range are migratory. Charles Vaurie described subspecies beavani (after Robert Cecil Beavan) as the population that breeds along the Himalayas that wintered in peninsular India. However, later workers include this as part of longicaudatus which also has a population that breeds in central India. In winter, the species is particularly fond of hill forests. E. C. Stuart Baker described stevensi which Vaurie considered as being either beavani or hopwoodi of the eastern Himalayas. To the east of the range of hopwoodi is mouhouti of Thailand and Myanmar. To the north of this range are leucogenis and salangensis (both migratory mainly to areas further south but also known from Nagaland) while bondi is found to the south. 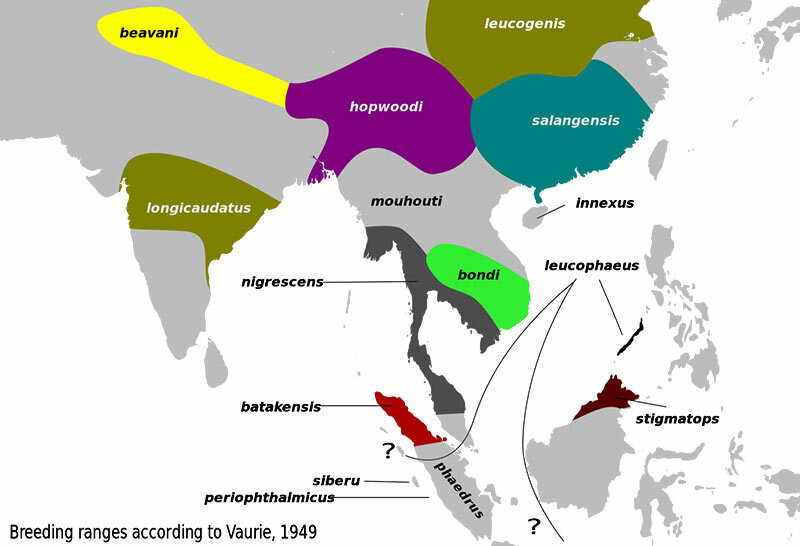 Along the southeast Asian island chain, there are number of insular populations including periophthalmus, batakensis, phaedrus, siberu and nigrescens. 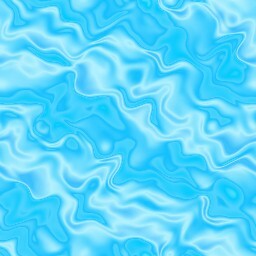 The nominate form is said to be found on Simalur, Java, Bali, Lombok, Palawan, and Balabac Islands. Subspecies longicaudatus of India (which includes beavani of the Himalayas that winters on the peninsula, with one breeding population in central India that Vaurie separates as longicaudatus in the restricted sense) is very dark and almost like the black drongo although this bird is slimmer and has a somewhat longer and less-splayed tail. 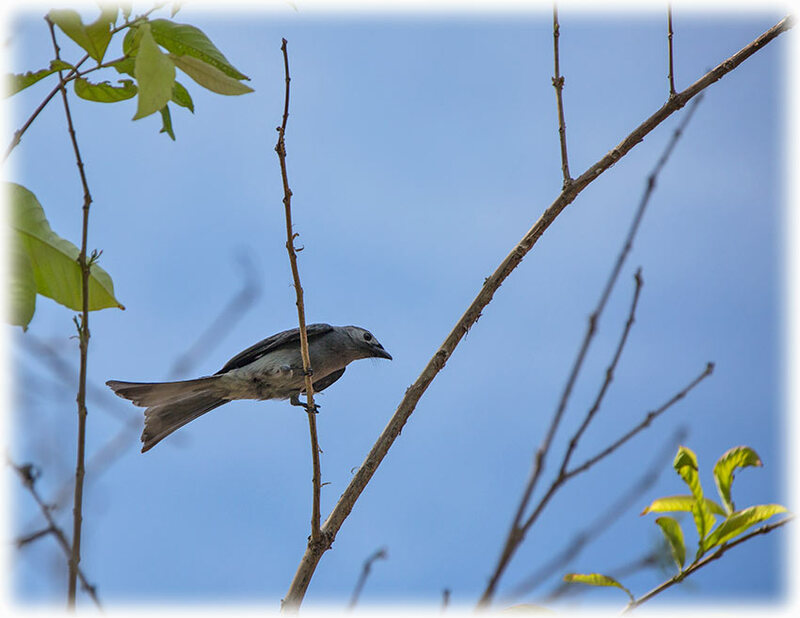 It is found in more tall forest habitat, has dark grey underside lacking the sheen of black drongo. The iris is crimson and there is no white rictal spot. Subspecies leucogenis and salangensis have a white eye-patch as do several of the island forms that breed further south. The calls are a little more nasal and twangy than that of the black drongo. PLEASE! As I'm a first time birdwatcher bear in mind that some of the bird can be wrongly named. I have bought books and I confirm on the internet to get the right identity on the birds I take pictures off. But there can still be mistakes. 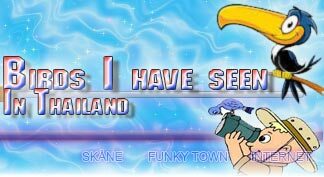 Among others I have used Peter Ericsson's web page Birds of Thailand These galleries contain 668 species of the Birds of Thailand and have been of a great help to identify some of the birds.